Latva wall, hang here your coats. 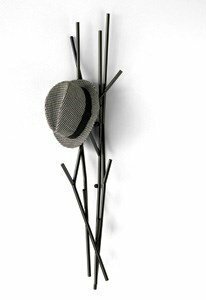 Imitating the branches of the trees, which traditionally decorate the walls of houses, Latva becomes a beautiful and elegant hanger. Personal and transferable, the ideal place for coats and bags! A sign of modern times, a simple and intuitive object that allows hanging coats and other items in an informal way but with style! Made in painted steel black.